At some point in 1996, I sat down to begin writing a draft of my application essays for rabbinical school at the Jewish Theological Seminary. One of the questions asked what the focus of my future rabbinate would be and it didn't take long to formulate an answer that included paying more attention to Jewish college students. As an active student in the university's Jewish community at the time, I recognized that college students don't often get the attention they should from their synagogues or temples back home. During high school, a lot of congregational funds and professional support are directed to youth groups. Staff members forge lasting relationships with Jewish teens, scholarships are awarded for retreat and convention attendance, leadership skills are taught, Israel trips are available that last much longer than ten days. When these teens leave home for college, however, it is largely believed that the Hillel on campus will take care of them. Aside from an annual visit from the congregational rabbi, there is often little connection from the synagogue. Hillel can be a one-size-fits-all solution for many Jewish college students and that is where the individual movement's college outreach programs come in to play. During my second year of college, I helped re-constitute a Koach chapter on my campus. Koach is the Conservative Movement's college outreach program. It was an important lifeline for Jewish students (many of whom were already active with Hillel) who affiliated with the Conservative branch of Judaism. My connection with Koach continued when I was in rabbinical school, teaching at a Koach kallah (retreat) and serving as a visiting Koach Scholar on college campuses. Today, the United Synagogue of Conservative Judaism votes on its new strategic plan. I haven't written about the state of United Synagogue in the past year, but I have been watching closely. Rather than criticize the organization, I've been interested to see how it redefines itself amidst a massive decline in affiliated synagogues. Like many Conservative rabbis and Conservative Jewish leaders across North America, I have long wondered how affiliated synagogues justify the hefty annual dues price tag to United Synagogue without getting much in return. The reality has long been that Conservative synagogues remain affiliated and pay dues so they will be able to participate in the placement process when they need to hire a new rabbi or cantor, and so their teens will be able to be members of United Synagogue Youth (USY), the movement's international youth group. Without enough support or resources to justify paying dues during the recession years, a large percentage of Conservative congregations disaffiliated. If congregations needed to hire new clergy during that time, they negotiated a settlement deal to re-affiliate and then promptly stopped their dues payments once the new rabbi or cantor was in place. Over the past few years, organized dissent has arisen from within the ranks of the Conservative Movement. One of the coalitions of critics, Hayom (rabbis and synagogue presidents), has joined forces with United Synagogue to construct a reinvention strategy through a new strategic plan. When a draft of this new strategic plan, crafted with the expert consulting of Dr. Jack Ukeles and sociologist Steven M. Cohen and under the co-chairmanship of Professor Jacob Finkelstein and Rabbi Ed Feinstein, was posted on the USCJ website the criticism began. The most vocal complaint about United Synagogue's new plan was its reduction in funding and attention to its college outreach program. In response, a grassroots group (Mahar Coalition) of Conservative Jewish college students and alumni of Koach was formed. United Synagogue quickly revised its strategic plan, but without any monetary figures being changed in the revision that will be voted on today. Recommendation 4.5 "USCJ should shift its priority in connecting young Jewish adults from the college campus to the post-college generation, recognizing that the North American Jewish community has made a much more substantial investment in Jewish life on the college campus than it has in the young adult post-college generation." 4.6 "At the same time, USCJ needs to maintain a bridge between high school graduates and post-college young adults. USCJ should make a limited, focused investment in the college-age cohort by creating leadership development opportunities for the outstanding graduates of Ramah, USY, and Nativ, many of whom are studying at List College." 5.1 "The current campus environment is heavily serviced by Hillel and numerous other well-funded and professionally staffed efforts. The only way a relatively modest expenditure by USCJ can make a significant impact on campus is by highly focused interventions. While the USCJ cannot abandon Conservative Jewish college students, it needs a more effective vehicle than the current Koach program." The language above makes the jump from high school graduates to post-college young adults and seems to believe that Hillels will handle the Jewish outreach to college students. 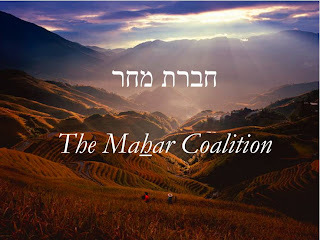 The Mahar Coalition has stated the obvious: they too want to engage in education and Torah learning through a lifeline to the Conservative Movement while on the college campus. Recommendation 4.5 "It is recognized that a continuing presence on campus for Conservative Judaism is vital to maintain the bridge between our high school students and the young adult post-college generation. It is not clear who should fund this effort and what the effort should look like. Since USCJ has been funding and administering the effort through Koach, in the short term USCJ should continue to do so in a highly focused and cost-efficient way. Simultaneously, USCJ should engage with college student leaders, and leaders of Conservative Judaism, to determine how best to work in partnership to ensure that the USCJ presence on the college campus not only remains but grows." The Mahar Coalition's response to the revision was fairly positive, but there was no decision by United Synagogue to shave less funding from Koach. Hopefully, the conversation will continue and individuals or foundations will step up to support the important outreach from United Synagogue to Conservative college students. United Synagogue's reputation is at stake here and there has been a tradition of having little transparency in their decision making over the decades. If the Conservative Movement is to dig out of its current predicament and truly reinvent itself, it cannot short shrift Conservative Jewish college students -- a highly impressionable demographic. They will only give member congregations more reason to question if affiliation is really worth the money. As one part of the newly passed plan, Koach – the movement’s college outreach project – will be reconfigured. Rabbi Wernick has previously said budgetary constraints and a revamping of his organization’s mission has meant that Koach, which received about $400,000 this year, would be receiving only about $225,000 to $250,000 next year. A decade ago, it had a budget of $750,000. While it is clearly time to rethink old models, one wonders how the Conservative movement, or for that matter any of the other religious streams, plan to meet the challenges of the 21st century when instead of increasing – they reduce – their outreach to this most important demographic. They apparently just don’t get it." As the mother of a recent college graduate, I can attest that Rabbi Miller nails it: The Conservative Movement needs to vigorously increase their outreach to this demographic. My son's disaffection with the state of Conservative Judaism began after his Bar Mitzvah. When he was in elementary school, he loved Hebrew school, but the curriculum in place from that point on focused on not alienating students by expecting too much of them. His enthusiasm returned in college, not because of outreach, but because he happened to take a course in Jewish thought that had substance and reawakened his love and enthusiasm for his religion. If we are going to keep young Conservative Jews, we have to stop insulting their intelligence. We have to give them challenging courses in Hebrew School, and we have to do more than send e-mail to Jewish students reminding them of Passover seders and Friday night dinners. We have to visit them personally, take them to lunch, meet them one on one. The consequences of ignoring this demographic could prove disastrous. I read your blog and half the time was nodding my head in agreement. But it's not just the Conservative Movement that is failing our students, it's the Jewish community as a whole. When most of the outreach to college students from the synagogue communities consist of "college connection baskets" we really need to rethink our strategy. Additionally, assuming that Hillels will be the gateway and touch point for all Jewish students is a mistake....on some campuses Hillels are not reaching the majority of students. Ruth is right, we need a new strategy. Outreach does not mean waiting for young Jews to come to you. That's what is wrong with relying on Hillel. We must learn directly from them what Conservative Jewish students need from us. And to do that, we need to seek them out and ask them. My son was so disappointed in Hebrew School at a high school level, that he had no interest in Hillel, he viewed it as more of the same. Ideally, a renewed strategy has to begin long before a young person gets to college. If we give our kids a dumbed down version of their own religion, we can't be terribly surprised if other religions in this open society seem better suited to meet their spiritual and intellectual needs.